Denim never goes out of trend and denim shorts are back yet again for this season. If you don't fancy paying out for denim shorts, why not do a touch of diy on a pair of existing jeans? Now Spring is here and summer is in the air, I thought I'd wear my 7 For All Mankind denim shorts that I customised from jeans earlier this year. I do like wearing them casually with black opaque tights for now and when summer is here I'll wear them with bare legs! How will you be wearing denim this spring-are shorts your thing, or do you prefer a denim skirt or denim capris for summer? You look so cute in your shorts, my friend. cut off shorts are so easy to wear and an effortless piece for spring and summer! love them! your shirt is great, too! I love the length of those jeans shorts- hard to find on the HS. I have an old pair of jeans languishing at the back of the wardrobe: might have to make my own too! Looking as lovely as ever my dear! I brought the youngest some shorts, highwaisted and after being worn a few time she has now decided they are far to big! well a new pair of shorts for me. Bless. I'm going to cut down a pair of trousers and make some. Mrs Jones says that's the best way to find the right fit and length. 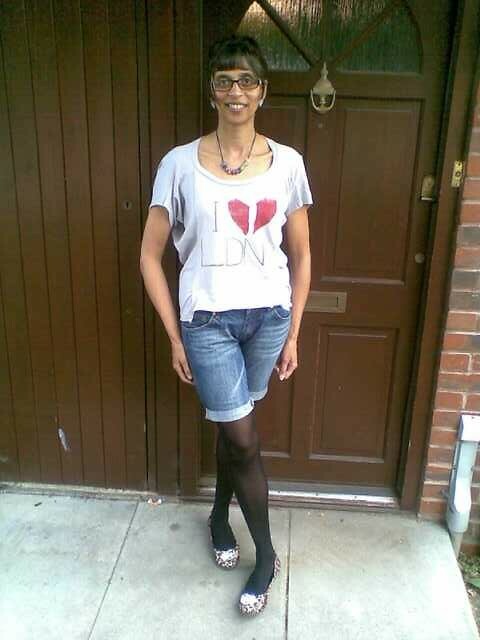 I love wearing shorts in summer especially denim but always quite long and just above the knee. I have never worn them with tights but my girls do. I do wear shorts with tights and I also love to wear capris instead of shorts during the Summer (which is almost the entire year for us). Great outfit, you look like a college girl! They look great on you, Sharon. I've got a very short pair, for which I fear I'm getting slightly too old - oh well, for the garden then. I'm going to make a pair of denim shorts soon. I couldn't wait for shorts weather (well, with tights even) but now it's here i cannot find my favourite old denim pair. It's a mystery! I like denim shorts for summer but generally wear them to the beach - like your customised ones - must feel peversely satisfying to be able to customise a pair of Current Elliots!